My return to cooking started with a sale on pork chops. 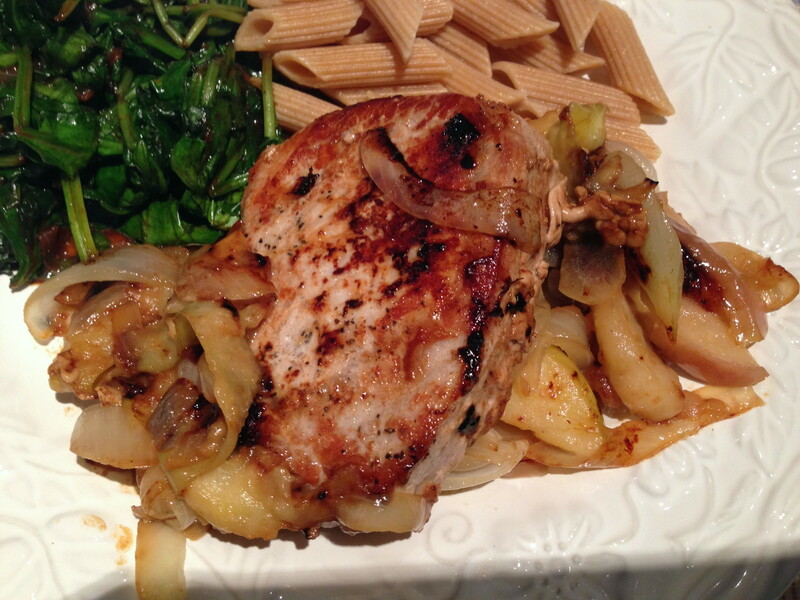 With apples in season, I decided to make Martha Stewart’s Pork Chops with Apples and Onions. You sear the pork chops first, and then saute a mixture of apples and onions. I stirred in some white wine, and then returned the pork chops to the pan to finish cooking. Pork chops can dry out so easily, but this recipe helps prevent that. The dish also offered a nice blend of savory and sweet. I served the pork with sauteed spinach and whole wheat pasta. It was a delicious fall meal, and also made great leftovers. But just one tip: bring a steak knife in your lunch bag! The bushel of butternut squash is now gone. We’ve made a basic squash soup, a fancier soup with beans and ham, butternut hash, butternut butter, and a butternut squash and kale torte. With the very last squash, I decided to make Roasted Butternut Squash, Pears, and Onions with Blue Cheese. The title pretty much says it all, but this recipe takes plain roasted vegetables up a notch. I loved the mix of squash, pears, and onions, and the strong-flavored blue cheese was a great touch. This would be good as a side dish, or perhaps accompanied by a nice spinach salad. I am a little sad that the squash is gone, but I am ready to move on to other vegetables. It’s the end of January, and I haven’t roasted any beets yet! Place squash, pear, and onion in a large bowl. In a small pot, melt the butter on medium heat. Add sage and thyme, and cook for 1-2 minutes. Remove from heat and stir in mustard. Pour butter mixture over vegetables and toss to coat. Place vegetables in a 13″x9″ dish. Bake at 375F for 45-50 minutes, or until tender and brown. Add cheese, and bake for an additional 5 minutes. The recipe is lightly adapted from Skinnytaste’s Butternut Squash Soup, but we just used basic black pepper for seasoning and added a touch of applesauce. It was a good chance to test out the new immersion blender that my Dad got for Christmas. It’s a fun gadget, and makes the soup so smooth. The soup is really simple, but has a rich flavor. I treat the containers in my freezer like gold. Place squash, onion, carrots, broth, and garlic in a large pot. Cover and simmer for 45 minutes, or until vegetables are very soft. Puree with an immersion blender. Season with black pepper. Stir in applesauce, and more water if the soup is too thick. Cook just until heated through. I said I would bake this weekend, and I did! But I didn’t make the hearty rolls I had planned; I decided to bake some treats for the freezer instead. I’ll get back to those rolls later, I promise. I was surfing the Internet, and spotted this recipe for Ginger Pecan Pumpkin Muffins. I had crystallized ginger leftover from the Dark Chocolate Brownies with Crystallized Ginger and Sea Salt that I made this summer. I had leftover pecans from my Mom’s pantry clean out. And way up top in my cabinet I had a stash of canned pumpkin. It was destiny, right? I did change a few things from the original recipe by using some whole wheat flour, replacing a portion of the sugar with honey, and changing the spices a bit. The muffins were quite good, and I liked the crunch of the pecans. You can only taste the ginger every few bites so if you want more of a kick, I would increase the amount of crystallized ginger to 1/3-1/2 cup, as in the original recipe. Although I know pumpkin is often enjoyed in the fall, these muffins are pretty good for January too. In a large bowl, mix flours, brown sugar, baking powder, baking soda, and spices. In another bowl, mix eggs, pumpkin, oil, yogurt, honey, and vanilla. Add wet ingredients to dry, and mix just until blended. Fold in pecans and ginger. Spoon batter into 12 muffin tins coated with cooking spray. Bake at 350F for 22-28 minutes. Thanksgiving doesn’t stop on Thursday. We have an annual extended family gathering on the Friday night after Thanksgiving that’s just as much fun as the big day itself. Usually we bring a dessert (probably because we’re almost always late!) This year, I wanted to make Joy the Baker’s Pumpkin Pie Bars. The bars have a bottom crust made with butter, flour, oats, and pecans, and this mixture is also used for a crumble topping. The filling is a rich mixture of cream cheese, pumpkin, sugar, and spices. The recipe has all the right ingredients so we had high expectations. Sadly, we were disappointed. But don’t they look pretty? The first problem was that the bars took significantly longer than expected to bake in the oven, and it was really difficult to tell when they were done. The recipe indicates they should be cooked until “the center no longer jiggles.” It’s pretty hard to see the filling underneath the crumble topping, so we ended up using a toothpick to help. The recipe also indicates that the bars should be chilled prior to cutting, but even after some time in the freezer, the center was still very soft. It was difficult to cut them into nice bars. After more time in the host’s refrigerator, the bars were still messy to eat. I think this recipe would work much better as a regular cheesecake that you enjoy with a fork. After Thanksgiving dinner, everyone is usually way too full for dessert. But you just can’t resist having something, right? These Pumpkin Cheesecake Shooters from Skinnytaste give you a small taste of something sweet, and they’re also adorable! I followed the recipe as written, and was able to make the filling ahead of time and store it in the refrigerator. Of course, I had to try it out to make sure it was acceptable for our guests. The pumpkin cheesecake was really good, but next time I would increase the amount of pureed pumpkin for a more intense flavor. A few hours before serving, I piped the filling and whipped topping into the glasses using the tried-and-true Ziploc bag with the corner snipped. We tried out a few different sized glasses including a regular shot glass, a larger cordial glass, and limoncello glasses. You really don’t need to buy any special glasses; use whatever you have around. Just remember that if you use a really narrow glass, you also have to provide spoons that can reach the bottom! When you just can’t decide what to have for dinner, there’s always “breakfast for dinner”. That’s how I enjoyed this butternut squash hash, although it would also be good for a weekend brunch. Feel free to expand the recipe to use a whole squash, I just happened to have half of one leftover from another project. This recipe takes some patience while you brown the onion and squash, but those crispy edges taste so great! I cracked the eggs right into the same pan, mostly because I was lazy and didn’t want to take out (and then wash) another pan. But this worked out really well, and it was a fun “breakfast for dinner” meal. Place butternut squash cubes in a bowl, and cover with water. Microwave for 5-8 minutes, until starting to soften. Drain and set aside. Meanwhile, heat oil in a large frying pan. Add onion, and cook for 5-10 minutes. When squash is drained, add to frying pan. Cook for 20-30 minutes over medium heat, stirring occasionally. Season with paprika. The onion and squash should brown, but turn down the heat if they are burning. When the hash is ready, make 3-4 indentations in the pan. Spray bottom of pan with cooking spray if dry. Crack an egg into each space. Cover, and cook for 5 minutes. Remove cover and sprinkle Parmesan cheese over eggs. Replace cover and cook for 1-2 minutes more, until eggs are set.